Safe Starch Forage is an all in one diet for mature horses! It is a mixture of orchard and timothy hay, that provides horses with their entire diet of forage, as well as vitamins and minerals. No other hay, pasture, vitamin or mineral supplements are required to provide your horse a complete and balanced diet. 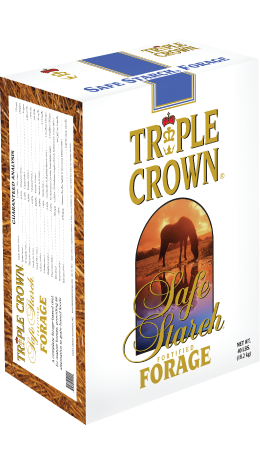 The grass hay used in Triple Crown Safe Starch Forage is specially seleced for low NSC levels and the product is molasses and grain free while providing 6% Fat.